One of the most popular Jamaican plays is back. This time it’s for part 3. 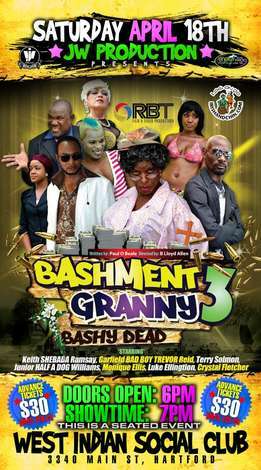 Bashment Granny 3 is a continuation of the original 2007 story, which saw a desperate ‘Bad Boy Trevor’, played by Garfield Reid, use his so-called father, ‘Mr Bashy’, played by Maxwell Grant, in an attempt to fleece millions from a Miss P, a generous friend from the UK continues. In part 2, we found out that Trevor eventually went to prison and was unable to enjoy the cash which would have been the fruits of his deceitful labour. Instead, the money was inherited by Shebada and Mr Bashy, who invested the money. But the investment turned out to have been very risk, resulting in losses. Half-a-Dog, the real owner of the cash, subsequently jetted in from New York in a bid to collect what was thought to be rightfully his. The third installment of Bashment Granny, which will hit the stage of the West Indian Social Club on April 18th, picks up right where the sequel left off. It opens with Trevor’s release from prison, Shebada in hiding and Half-a-Dog still barking and sniffing for his cash. In Bashment Granny 3, Half-a- Dog is determined to collect his bone.